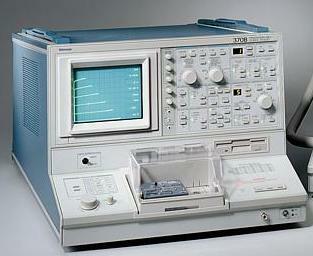 The Tektronix 370 (variants: 370A, 370B) is a high-performance, stand-alone, GPIB-programmable digital curve tracer that provides static and dynamic semiconductor device measurements. It measures and displays the characteristics of a variety of two-, three- and four-terminal devices including diodes, bipolar transistors, FETs, SCRs/thyristors, opto-isolators and integrated circuits. The 370 can store test set-ups and families of curves on a bubble memory cassette (020-1310-00). Models 370A and 370B use a floppy disk for storage of setup and measurement data. All models have GPIB and plotter interfaces. Control settings and cursor values are displayed on screen. Test sequencing does not require a GPIB controller. This page was last edited on 31 March 2019, at 07:20.